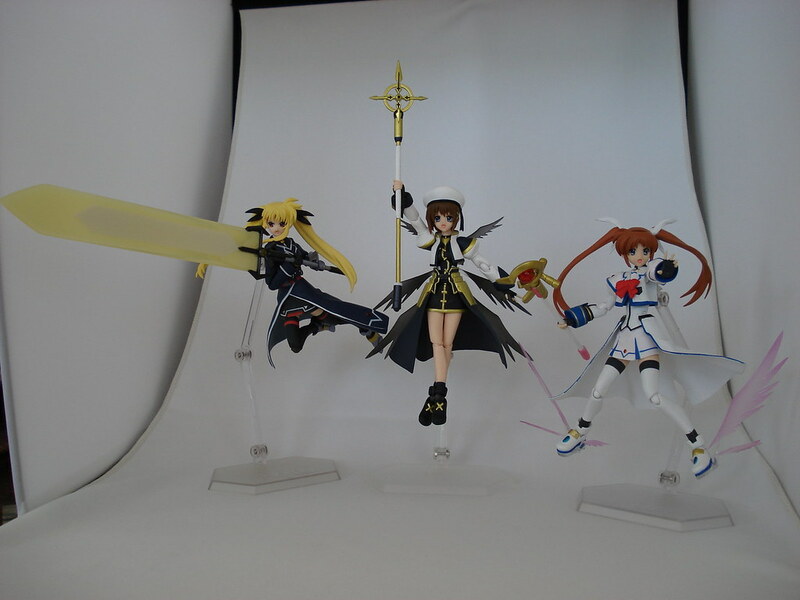 Hayate is chock full of special accessories. 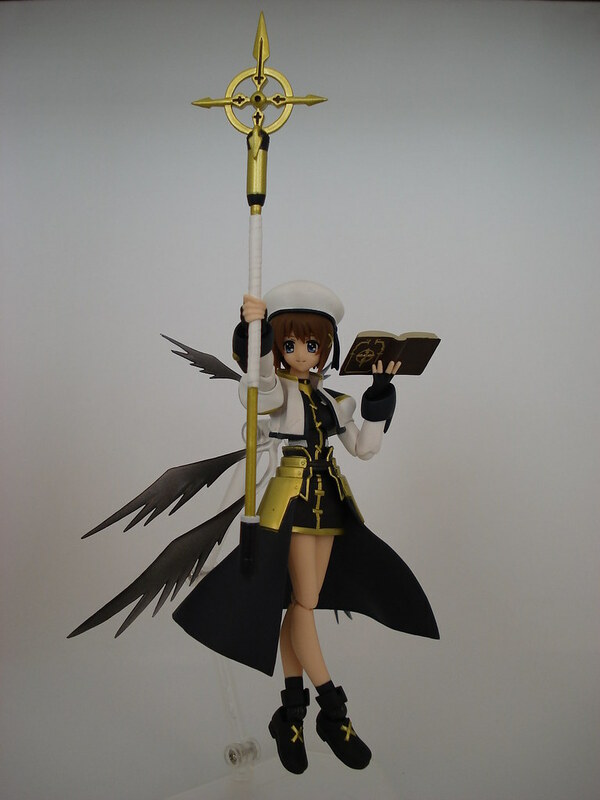 First off,she comes with the standard figma 3-jointed stand and base. 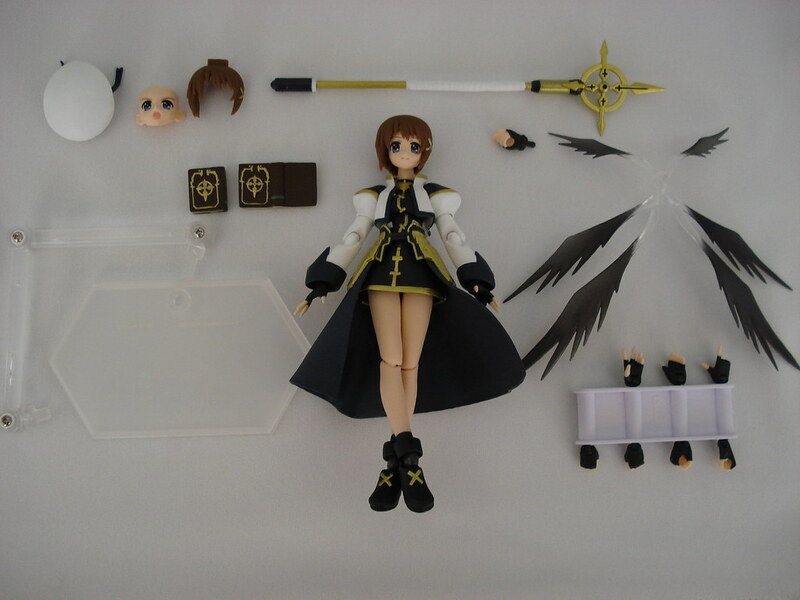 She has a set of accessory hands for holding things like staves and swords. 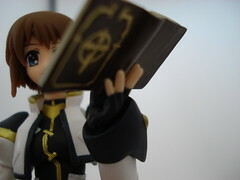 She also comes with a regular fist for each hand. 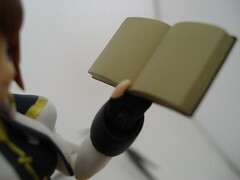 Equipped on her out of the box are two hands with the spread fingers. 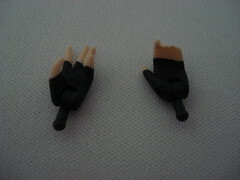 Her right hand also comes with a pointing finger. She does not come with the palm with fingers together for either hand, but she does come with two special hands to hold the two different versions of the Book of the Night Sky (Buch der Nachthimmel) which I will go over below. She also has an alternate face with her mouth open and shouting, and a set of bangs with a tab in it for her beret. Her wings affix to her back with a small removable peg that goes into the figma hole in her back, and the peg can be removed in order to affix it to the figma stand for flight and action poses with the wings. 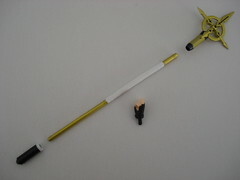 Lastly, she comes with the Equipment Device Schwertkreuz, with the ornamental part and the base part removable. A special right hand without a joint is included for wielding Schwertkreuz. 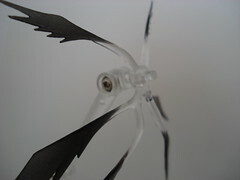 As you can see above, Schwetkreuz is segmented at the base and at the ornamental head. 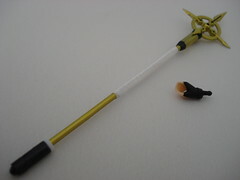 I recommend inserting the rod through the top of the hole in the fist from the bottom of the rod, and gently work your way through the bandaged part when you get to it. 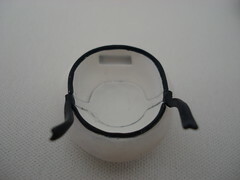 The bandaged part has a slightly larger diameter than the hole in the fist, so it’ll take a bit of work to get it in the right position. 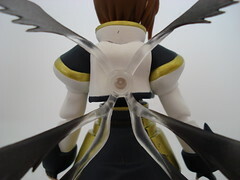 Wings: Click on the image above to see a higher res version where you can see the clear peg used for attaching the wings to Hayate’s back when she’s not connected to the stand. 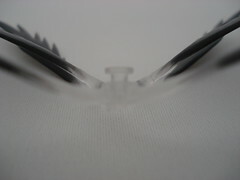 You can push the peg out from the end where it attaches to the hole to remove it carefully. 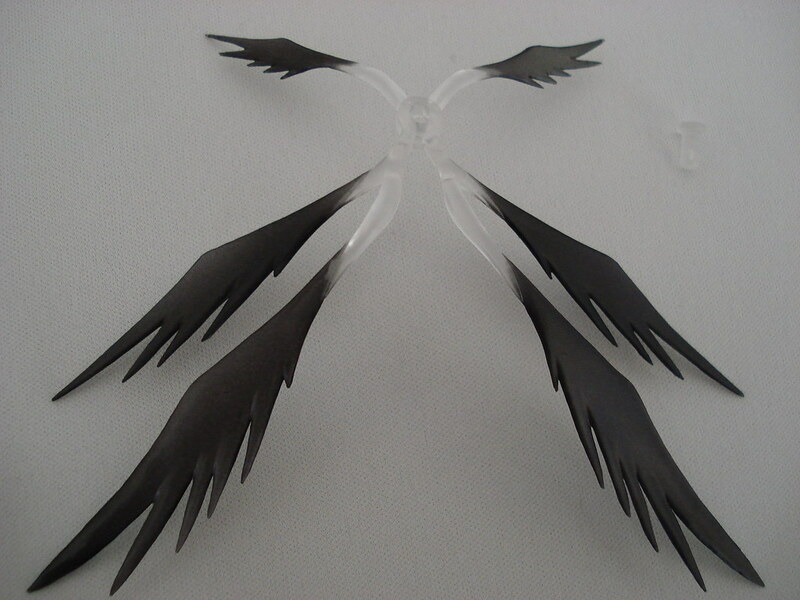 The wings can be used with other figma (with the possible exception of figma with long hair if you intend to use the wings with the stand) but are molded specifically for Hayate’s figma. 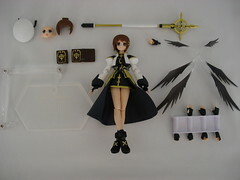 The extra set of bangs are molded exactly as the ones she comes with, except for the tab. 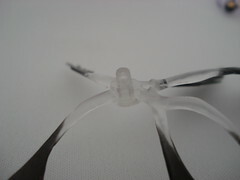 This ensures that the hat is secure on her head for action poses, and also keeps the bangs securely on the head, should they become loose from swapping them too much. 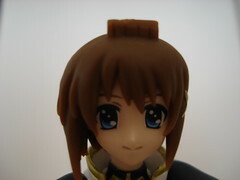 I’ve found that the bangs on Hayate and more recent figmas are a lot more secure, so they don’t slip out as often as some of the older ones. 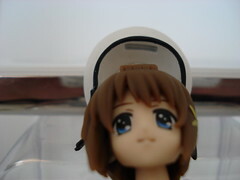 They could’ve included just a hat without the tab and slot, but this kind of molding shows how much care GSC and MF put into their figma line. Pros: I love everything about this figma from the hands to the wings. 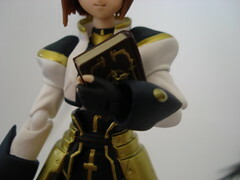 The specially sculpted hands for holding the books are a nice touch, even though Hayate usually floats the Book of the Night Sky in front of her when she’s using it, and the special fist for wielding Schwetzkreuz is great as well. As I mentioned above, the fact that GSC and MF specially molded a set of bangs specifically for securing the beret shows the care that they put into their line of figmas, and that kind of attention to detail will keep me purchasing figmas more and more. 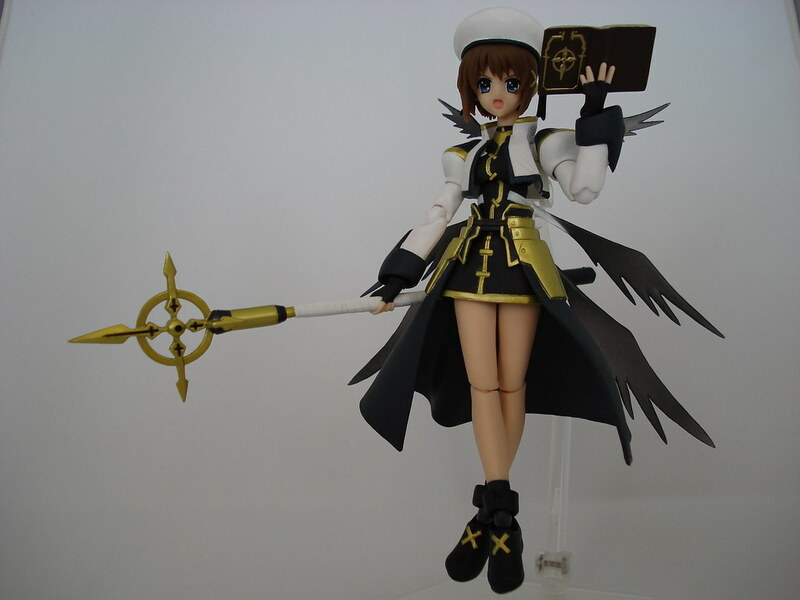 Cons: The only problem I have with the figma is a selfish one at that. I’m slightly annoyed at how difficult it is to remove the Knight Armor skirt she comes with. I know it’s removable, since it’s loose, but it requires one to seperate her torso from her hips, which could potentially make the joint loose and possibly cause it to fall off without warning, so I haven’t done so. 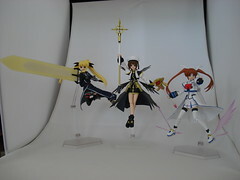 As I’ve shown with Nanoha’s skirt being removed, I’m sure Hayate would look great even without the skirt.